The strong personality of an important object, a styling project capable of interpreting design in a creative manner. The legs of Twice are available in many different finishes. 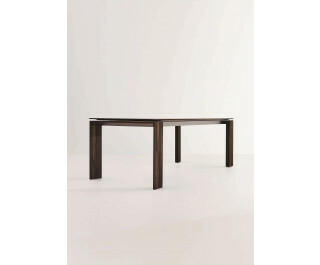 The table top is available in glass or wood. In the extending version, thanks to the side movement, the legs are positioned at the end of the table, without getting in the way of the seated guests; the 70 cm extension makes it possible to increase the length of the table top.